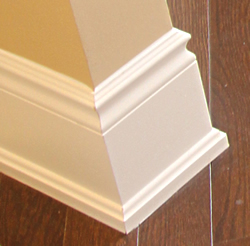 An ideal way of dressing a baseboard and achieving a finishing touch to your wood work, our Toronto based company provides either shoe molding or quarter round as a simple and cost-effective service. Not only does it contribute to the style of a room but serves a functionality in concealing any gaps that are present where your floor meets the baseboard or wall. As an expert installer of Quarter round, we understand that it may also serve the purpose of holding the floor beneath in place. This is applicable both to hardwood and laminate floors. Standard quarter round is basically shaped like quarter of a circle and is usually applied along the foot of the baseboard. Shoe molding is typically more oval like in appearance and is slightly smaller. It serves to provide similar aesthetic and protective benefits as quarter round. Various selections are displayed and available to buy from our showroom. 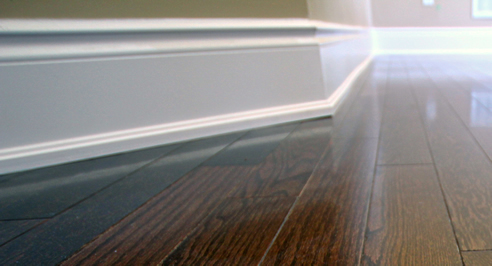 Inexpensive and effectively installed it will provide an extra dimension to a standard baseboard and trim. Perfect for protecting your baseboard at floor level as well as smoother transition between baseboard and floor. 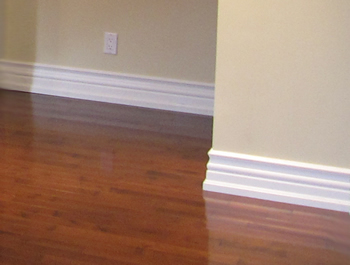 Primed and easily painted to integrate with an existing baseboard installation. Stained models available to work in co-ordination with a stained baseboard or treated floor. Small shoe moldings are a quick and low-price method of adding character to your home. Curved or rounded walls can also be catered for with flexible shoe molding and quarter round, allowing consistent and complete union within a room. Our shoe moldings and quarter rounds are cost effective and installed with the highest quality to ensure they will stay in place. Our quarter round products grant your baseboards with protection as well as concealing unwanted run off, broken tiling, damaged wood or linoleum.